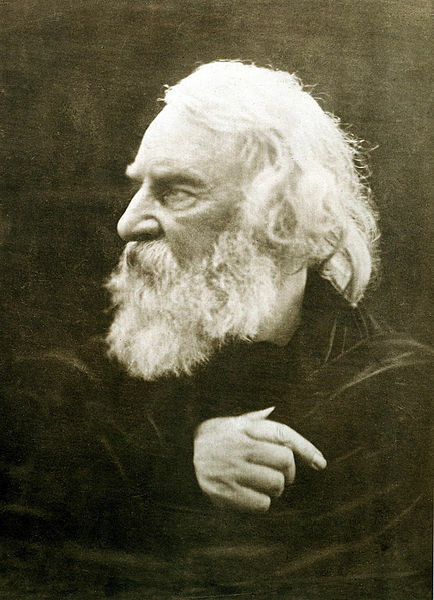 LONGFELLOW, HENRY WADSWORTH (1807-1882), great American poet, often referred to as the "Children's Poet" was born on the 27th of February 1807, in Portland, Maine. His ancestor, William Longfellow, had immigrated to Newbury, Massachusetts, in 1676, from Yorkshire, England. His father was Stephen Longfellow, a lawyer and United States congressman, and his mother, Zilpha Wadsworth, a descendant of John Alden and of “Priscilla, the Puritan maiden." Longfellow embraced the genre of Transcendentalism. We feature many works in our collections of Children's Poems and Poetry for Students. Longfellow was a member of the New England "Fireside Poets" which included Oliver Wendell Holmes, Sr., William Cullen Bryant, John Greenleaf Whittier, and James Russell Lowell. The “tranquil bay” is Casco Bay, one of the most beautiful in the world, studded with bold, green islands, well fitted to be the Hesperides of a poet's boyish dreams. At the age of fifteen Longfellow entered Bowdoin College at Brunswick, a town situated near the romantic falls of the Androscoggin River, about 25 m. from Portland, and in a region full of Indian scenery and legend. Here he had among his classmates, Nathaniel Hawthorne, George B. Cheever and J. S. C. Abbott. During the latter years of his college life he contributed several poems to the United States Literary Gazette , which are interesting for two reasons: (1) demonstrate the poet's early, book-mediated sympathy with nature and legendary heroisms; and. (2) are free from that supernatural view of nature which he later adopted living in Europe. He graduated in 1825, at the age of eighteen, with honors, and wrote the “class poem” — taking the fourth place in a class of thirty-eight. He then entered his father's law office, without intending, however, it would appear, to devote himself to the study of the law. For this profession he was, both by capacity and tastes, utterly unfitted, and it was fortunate that, shortly after his graduation, he received an offer of a professorship of modern languages at Bowdoin College. In order the better to qualify himself for this appointment, he went to Europe (May 15th, 1826) and spent three years and a half traveling in France, Italy, Spain, Germany, Holland and England, learning languages, for which he had unusual talent, and drinking in the spirit of the history and life of these countries. The effect of Longfellow's visit was twofold. On the one hand, it widened his sympathies, gave him confidence in himself and supplied him with many poetical themes; on the other, it traditionalized his mind, coloured for him the pure light of nature and rendered him in some measure unfit to feel or express the spirit of American nature and life. His sojourn in Europe fell exactly in the time when, in England, the reaction against the sentimental atheism of Shelley, the pagan sensitivity of Keats, and the sublime, Satanic outcastness of Byron was at its height; when, in the Catholic countries, the negative exaggerations of the French Revolution were inducing a counter current of positive faith, which threw men into the arms of a half-sentimental, half-aesthetic medievalism; and when, in Germany, the aristocratic paganism of Goethe was being swept aside by that tide of dutiful, romantic patriotism which flooded the country, as soon as it began to feel that it still existed after being run over by Napoleon's war-chariot. He returned to America in 1829, and remained six years at Bowdoin College (1829-1835), during which he published various text-books for the study of modern languages. In his twenty-fourth year (1831) he married Miss Mary Story Potter, one of his “early loves.” In 1833 he made a series of translations from the Spanish, with an essay on the moral and devotional poetry of Spain, and these were incorporated in 1835 in Outre-mer: a Pilgrimage beyond the Sea. In 1835, Longfellow was chosen to succeed George Ticknor as professor of modern languages and belles-lettres in Harvard. On receiving this appointment, he paid a second visit of some fifteen months to Europe, this time devoting special attention to the Scandinavian countries and Switzerland. During this visit he lost his wife, who died at Rotterdam, on the 29th of November 1835. On his return to America in December 1836, Longfellow took up his residence in Cambridge, and began to lecture at Harvard and to write. In his new home he found himself amid surroundings entirely congenial to him. Its spaciousness and free rural aspect, its old graveyards and towering elms, its great university, its cultivated society and its vicinity to humane, substantial, busy Boston, were all attractions for such a man. In 1837-1838 several essays of Longfellow's appeared in the North American Review, and in 1839 he published Hyperion: a Romance, and his first volume of original poetry, entitled Voices of the Night. Hyperion, a poetical account of his travels, had, at the time of its publication, an immense popularity, due mainly to its sentimental romanticism. At present few persons beyond their teens would care to read it through, so unnatural and stilted is its language, so thin its material and so consciously mediated its sentiment. Nevertheless it has a certain historical importance, for two reasons — (1) because it marks that period in Longfellow's career when, though he had left nature, he had not yet found art, and (2) because it opened the sluices through which the flood of German sentimental poetry flowed into the United States. The Voices of the Night contains some of his best minor poems, e.g. “The Psalm of Life” and “Footsteps of Angels.” In 1842 Longfellow published a small volume of Ballads and other Poems, containing some of his most popular pieces, e.g. “The Skeleton in Armour,” “The Wreck of the Hesperus,” “The Village Blacksmith,” “To a Child,” “The Bridge,” “Excelsior.” In the same year he paid a third brief visit to Europe, spending the summer on the Rhine. During his return-passage across the Atlantic he wrote his Poems on Slavery (1842), with a dedication to Channing. These poems went far to wake in the youth of New England a sense of the great national wrong, and to prepare them for that bitter struggle in which it was wiped out at the expense of the lives of so many of them. In 1843 he married again, his wife being Miss Frances Elizabeth Appleton of Boston, a daughter of Hon. Nathan Appleton, one of the founders of Lowell, and a sister of Thomas G. Appleton, himself no mean poet. About the same time he bought, and fixed his residence in, the Craigie House, where he had formerly only been a lodger, an old “revolutionary house,” built about the beginning of the 18th century, and occupied by General Washington in 1776. This quaint old wooden house, in the midst of a large garden full of splendid elms, continued to be his chief residence till the day of his death. Of the lectures on Dante which he delivered about this time, James Russell Lowell says: “These lectures, illustrated by admirable translations, are remembered with grateful pleasure by many who were thus led to learn the full significance of the great Christian poet.” Indeed, as a professor, Longfellow was eminently successful. Shortly after the Poems on Slavery, there appeared in 1843 a more ambitious work, The Spanish Student, a Play in Three Acts, a kind of sentimental “Morality,” without any special merit but good intention. If published nowadays it would hardly attract notice; but in those gushing, emotion-craving times it had considerable popularity, and helped to increase the poet's now rapidly widening fame. A huge collection of translations of foreign poetry edited by him, and entitled The Poets and Poetry of Europe, appeared in 1845, and, in 1846, a few minor poems — songs and sonnets — under the title The Belfry of Bruges. In 1847 he published at Boston the greatest of all his works, Evangeline, a Tale of Acadie. It was, in some degree, an imitation of Goethe's Hermann and Dorothea, and its plot, which was derived from Hawthorne's American Note-Books, is even simpler than that of the German poem, not to say much more touching. At the violent removal by the British government of a colony of French settlers from Acadie (Nova Scotia) in 1755, a young couple, on the very day of their wedding, were separated and carried in different directions, so that they lost all trace of each other. The poem describes the wanderings of the bride in search of her lover, and her final discovery of him as an old man on his death-bed, in a public hospital which she had entered as a nurse. Slight as the story is, it is worked out into one of the most affecting poems in the language, and gives to literature one of its most perfect types of womanhood and of “affection that hopes and endures and is patient.” Though written in a metre deemed foreign to English ears, the poem immediately attained a wide popularity, which it has never lost, and secured to the dactylic hexameter a recognized place among English metres. In 1849 Longfellow published a novel of no great merit, Kavanagh, and also a volume of poems entitled The Seaside and the Fireside, a title which has reference to his two homes, the seaside one on the charming peninsula of Nahant, the fireside one in Cambridge. One of the poems in this collection, “Resignation,” has taken a permanent place in literature; another, “Hymn for my Brother's Ordination,” shows plainly the nature of the poet's Christianity. His brother, the Rev. Samuel Longfellow, was a minister of the Unitarian Church. He did stay a little longer; but the embers that still burnt in him refused to be covered up. He would fain have ceased writing, and used to say, “It's a great thing to know when to stop”; but he could not stop, and did not stop, till the last. He continued to publish from time to time, in the magazines, poems which showed a clearness of vision and a perfection of workmanship such as he never had equalled at any period of his life. Indeed it may be said that his finest poems were his last. Of these a small collection appeared under the title of Keramos, and other Poems (1878). Besides these, in the years 1875-1878 he edited a collection of Poems of Places in thirty-one small volumes. In 1880 appeared Ultima Thule, meant to be his last work, and it was nearly so. In October 1881 he wrote a touching sonnet on the death of President Garfield, and in January 1882, when the hand of death was already upon him, his poem, Hermes Trismegistus, in which he gives utterance, in language as rich as that of the early gods, to that strange feeling of awe without fear, and hope without form, with which every man of spotless life and upright intellect withdraws from the phenomena of time to the realities of eternity. In the last years of his life he suffered a great deal from rheumatism, and was, as he sometimes cheerfully said, “never free from pain.” Still he remained as sunny and genial as ever, looking from his Cambridge study windows across the Brighton meadows to the Brookline hills, or enjoying the “free wild winds of the Atlantic,” and listening to “The Bells of Lynn” in his Nahant home. He still continued to receive all visitors, and to take occasional runs up to Castine and Portland, the homes of his family. About the beginning of 1882, however, a serious change took place in his condition. Dizziness and want of strength confined him to his room for some time, and, although after some weeks he partially recovered, his elasticity and powers were gone. On the 19th of March he was seized with what proved to be peritonitis, and he died on the 24th. The poet was buried two days afterwards near his “three friends” in Mount Auburn cemetery. The regret for his loss was universal; for no modern man was ever better loved or better deserved to be loved. Longfellow was made an LL.D. of Bowdoin College in 1828,. at the age of twenty-one, of Harvard in 1859 and of Cambridge (England) in 1868, and D.C.L. of Oxford in 1869. In 1873 he was elected a member of the Russian Academy of Science, and in 1877 of the Spanish Academy. In person, Longfellow was rather below middle height, broad shouldered and well built. His head and face were extremely handsome, his forehead broad and high, his eyes full of clear, warming fire, his nose straight and graceful, his chin and lips, rich and full of feeling as those of the Praxitelean Hermes, and his voice low, melodious and full of tender cadences. His hair, originally dark, became, in his later years, silvery white, and its wavy locks combined with those of his flowing beard to give him that leonine appearance so familiar through his later portraits. Charles Kingsley said of Longfellow's face that it was the most beautiful human face he had ever seen. A bust to his memory was erected in the Poet's Corner in Westminster Abbey in 1884. In Longfellow, the poet was the flower and fruit of the man. His nature was essentially poetic, and his life the greatest of his poems. Those who knew only the poems he wrote could form but a faint notion of the harmony, the sweetness, the manliness and the tenderness of that which he lived. What he would have been as a poet, if, instead of visiting Europe in early life and drinking in the spirit of the middle ages under the shadows of cathedral towers, he had, like Whittier, grown old amid American scenery and life, we can only guess from his earlier poems, which are as naturalistic, fresh and unmystical as could be desired; but certain it is that, from his long familiarity with the medieval view of nature, and its semi-pagan offspring, the romantic view, he was brought, for the greater part of his life, to look upon the world of men and things either as the middle scene of a miracle play, with a heaven of rewarding happiness above and a purgatory of purifying pain below, or else as a garment concealing, while it revealed, spiritual forms of unfathomed mystery. During this time he could hear “the trailing garments of the night sweep through her marble halls,” and see “the stars come out to listen to the music of the seas.” Later on, as he approached his second youth (he was spared a second childhood), he tended to a more pagan view. About the time when he was writing The Mask of Pandora, he could see “in the sunset Jason's fleece of gold,” and hear “the waves of the distracted sea piteously calling and lamenting” his lost friend. But through all the periods of his life his view of the world was essentially religious and subjective, and, consequently, his manner of dealing with it hymnal or lyric. This fact, even more than his merits as an artist, serves to account for his immense popularity. Too well-informed, too appreciative and too modest to deem himself the peer of the “grand old masters,” or one of “those far stars that come in sight once in a century,” he made it his aim to write something that should “make a purer faith and manhood shine in the untutored heart,” and to do this in the way that should best reach that heart. This aim determined at once his choice of subjects and his mode of treating them. The subjects of Longfellow's poetry are, for the most part, aspects of nature as influencing human feeling, either directly or through historical association, the tender or pathetic sides and incidents of life, or heroic deeds preserved in legend or history. He had a special fondness for records of human devotion and self-sacrifice, whether they were monkish legends, Indian tales, Norse drápas or bits of American history. His mode of treatment is subjective and lyric. No matter what form his works assume, whether the epic, as in Evangeline, The Courtship of Miles Standish and Hiawatha, the dramatic, as in The Spanish Student, The Golden Legend and The Mask of Pandora, or the didactic, as in The Psalm of Life and many of the minor poems; they are all subjective. This is not the highest praise that can be given to works of art; but it implies less dispraise in Longfellow's case than in almost any other, by reason of his noble subjectivity. If we look in Longfellow's poetry for originality of thought, profound psychological analysis or new insights into nature, we shall be disappointed. Though very far from being hampered by any dogmatic philosophical or religious system of the past, his mind, until near the end, found sufficient satisfaction in the Christian view of life to make it indifferent to the restless, inquiring spirit of the present, and disinclined to play with any more recent solution of life's problems. He had no sympathy with either scepticism or formal dogmatism, and no need to hazard rash guesses respecting man's destiny. He disliked the psychological school of art, believing it to be essentially morbid and unhealthy. He had no sympathy with the tendency represented by George Eliot, or with any attempt to be analytic in art. He held art to be essentially synthetic, creative and manifesting, not analytic, destructive or questioning. Hence he never strove to draw from nature some new secret, or to show in her relations never discovered before. His aim was to impress upon her familiar facts and aspects the seal of his own gracious nature. A man in intellect and courage, yet without conceit or bravado; a woman in sensibility and tenderness, yet without shrinking or weakness; a saint in purity of life and devotion of heart, yet without asceticism or religiosity; a knight-errant in hatred of wrong and contempt of baseness, yet without self-righteousness or cynicism; a prince in dignity and courtesy, yet without formality or condescension; a poet in thought and feeling, yet without jealousy or affectation; a scholar in tastes and habits, yet without aloofness or bookishness; a dutiful son, a loving husband, a judicious father, a trusty friend, a useful citizen and an enthusiastic patriot, — he united in his strong, transparent humanity almost every virtue under heaven. A thoroughly healthy, well-balanced, harmonious nature, accepting life as it came, with all its joys and sorrows, and living it beautifully and hopefully, without canker and without uncharity. No man ever lived more completely in the light than Henry Wadsworth Longfellow. See his Life . . . with Extracts from his Journals and Correspondence, by Samuel Longfellow, and the “Riverside” edition of the prose and poems (Boston, 11 vols., 1886-1890). An enlarged edition of the Life (3 vols., 1891) included the journals and correspondence, 1866-1882, published in 1887 as Final Memorials (Boston and New York). Also the volume by T. W. Higginson in the “American Men of Letters” series (1902); E. C. Stedman's criticism in Poets of America; and an article in W. D. Howells' My Literary Friends and Acquaintance (New York, 1900) which contains a valuable account of Longfellow's later life. Auf Wiedersehen. - In Memory Of J.T.F. Hymn Of The Moravian Nuns Of Bethlehem At The Consecration Of Pulaskis Banner. Voices Of The Night - Hymn To The Night. Voices Of The Night - Prelude.